Due mainly to the influence of people like founding board member Terry Brown, FollowOne has affirmed the value of adoption from our beginning in 2004. Although we do not have a particular adoption "program," we are glad that God has used us to encourage and bless many families who have heard God's call to adopt. The pictures, stories and testimonies in this communication are provided by some of the adoptive families in the FollowOne family. They are responding to two questions: What has God taught you through the adoption process and your son/daughter? What Bible verse is most important to you as an adoptive parent? Adoption has made me realize how much I am supposed to love ALL of God's children. Sophie is no more related to me than any other person on earth, but because God gave her to us, I see my calling and ability to love others like my own family. God taught us to trust in His provision. We learned to have patience and humility as we were examined by others to decide if we were suitable parents. God taught me to be willing to take the next step of faith (in Easton's story it was many steps), and to rely on God's faithfulness as he worked and encouraged us through others. He also taught me, a skeptic at times, to believe in miracles. God has used Shuler and Easton to show me how selfish I am at the core, and God has created in me a deeper Christian worldview. God has shown me that His plan for our family is better than what I could plan, and He has allowed me to see joy in ways I never had. Most importantly, it was at a FollowOne conference that the Holy Spirit spoke directly to Emily and me at the exact same time - we were called to adopt! " If I had to claim one lesson, it would come from Psalm 113:9, which reads, "He settles the barren woman in her home as a happy mother of children. Praise the LORD." I can remember sitting on the couch with Clay after years of failed attempts to have a family. We cried out to God from the most barren, empty place I have ever been in my life. Our prayer was, "God, you are our only answer. We don't have the money, the connections, or the answers. If you don't answer our prayer, this dream of a family will not come true." Within two weeks, God matched us with Easton and brought $15,000 into our lives out of thin air. God was so clear. He wanted us to know that He was giving us this child. Within two years, we brought Shuler home in a perfect answer to prayer. Even recently, when Clay and I went through a stressful situation that seemed to have no answer, we remembered the day when we sat on the couch and prayed, "God, you are the only answer." God creates families from barrenness. He brings hope to hopeless situations. He is the answer when it seems that there is no answer. I try not to forget that Easton and Shuler are gifts from heaven. So many nights, I remember rocking Easton and tears would run down my face as I thought, "Thank you, sweet boy, for letting me be your mom." I would pray, "Lord, never let me take this gift for granted." The day we met Shuler in China, I remember being amazed that God would bless us and entrust us with something so precious. Clay and I brought toys to play with him and we kept saying, "Now, it's my turn." We just couldn't believe how wonderful he was! We still walk in their rooms and tuck them in and shake our heads like, "Wow. They are our children! What a gift!" I feel as though God is using our little family to illustrate, in some miniscule manner, His far-reaching grace extended to us through our adoption in Christ. Lucy was adopted into our family from Hunan, China at 14 months of age in 2006. 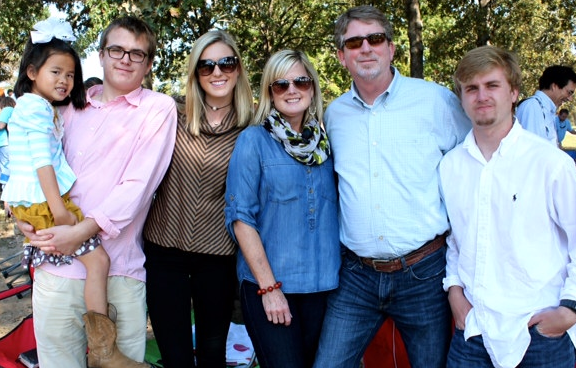 The unthinkable happened when less than two years later my wife, Judy, died from breast cancer. A little over a year later I married Kim. She and her son Matthew adopted Lucy, my son Caleb and myself into their family, and we adopted them into ours. 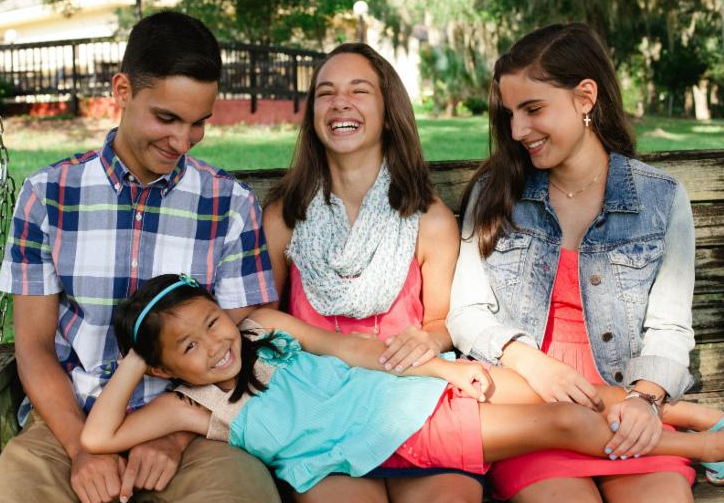 It is no small irony that Kim had been adopted from Korea at age 6 when an American GI brought her home to his family in Texas. We stand in awe at what God has done and continues to do in our very midst. Through God's amazing gift of adoption, we have been given a small glimpse of His radical love that is so outrageously boundless and far-reaching that no human can fully comprehend. Our family stands in awe of a mighty love that ever encourages us to love others without limits while simultaneously reminding us of God's mighty love toward us who are both His children and full heirs of the Kingdom of God. The biggest theme God keeps revealing about Himself is that His grace is enough. You see a picture of a child, you pray for this child as you wait to meet her and are completely in love by the time you hold her in your arms. But then reality sets in, our love is not enough, but His grace is sufficient. Children who are adopted come with a story of loss. Josie didn't trust us, and she was scared. We had to patiently teach her over and over that we would never leave her, and that she could count on us for everything. And guess what? We have witnessed a transformation over the last five years that could only happen through the grace of our God. We love her, and she loves us. And she loves Jesus with her whole heart. God's grace, pure and simple. Josie has taught us much about trust. When she had learned enough English, as I tucked her in bed every night she would ask, "Mama, I get breakfast tomorrow?" I always responded, "Yes, honey. As soon as you wake up, I'll feed you." EVERY NIGHT for years. YEARS. I can't remember when she stopped asking. God has done a miracle in this child who was so scared and now fears nothing. 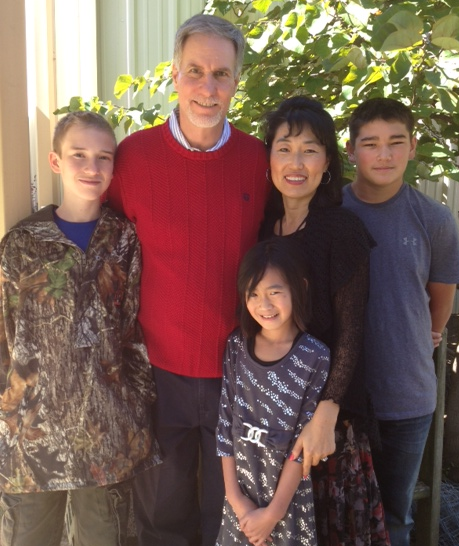 Following our first trip to China with FollowOne, Julie began a "full court press" on me regarding adoption. She had been very moved by the things we witnessed, particularly the trip to the day care center for physically/mentally handicapped children. I had been stiff-arming her for a few years, not because my heart didn't hurt for these lost children, but because my practical side was dominating. 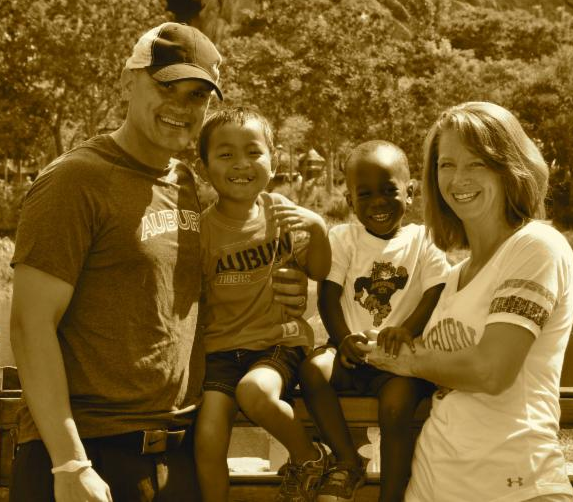 Julie and her friends began praying that I would open my heart and that God would give me the desire to adopt. Months later I was reading Acts 10. Cornelius, the Roman army officer (the Italian regiment, no less), and Peter had simultaneous visions to meet and eat together. A Gentile and a Jew. This is the pivotal moment where God's grace began to spread throughout the world, especially to non-Jewish cultures and languages. If Christians had not begun to reach out to people from different languages and backgrounds, I would not have been introduced to God's love. I then realized that if God loved me enough to graft me into His family tree then it was the least I could do to graft another of his children, Josie, into ours. That was the moment of clarity for me. The adoption process soon began. God has taught me that we are all adopted children, adopted by our Heavenly Father. My life is NOT insular, but it goes far beyond me. God has used the adoption process, and Josie herself, to teach me how to become more selfless and to share the love God has poured out to me. Before we adopted someone told Terry and me, "Only after you become a father will you begin to understand God's unconditional love for you." This has proven out so true. God has helped me understand how inadequate I am. God has taught me the need to just be there. God has shown me the value of humility. I am know this is the most important thing I will ever do - even when I am not doing it very well - so I persevere. God has taught me the blessing that comes from being obedient to a call, even one at the time that is way outside anything you ever thought you could or would do. Many people over the years have told me what blessing I am for our daughters, but I explain, "No, you don't get it. I am the one who is being blessed here." God called us to obedience but we got the blessing. Blessed to be a blessing. One of the things adoption has taught me is a reflective representation of God's love. When you are in the midst of an adoption, especially a foreign adoption, you love a child who has no idea who you are. You would gladly sacrifice time, money, and invasion of your life in order to know this child. That is a picture of what God has done for us. He knew me way before I knew Him. He gave the ultimate sacrifice so that I can be a part of His greater family. And while His family is so much greater than my earthly family, our family is complete because of what He has done in us and through us. Please join us in praying for Sophie, Shuler and Easton, Lucy, Josie, Maeji and Abby, and Sally and Charlie, their parents and their siblings. God has even more wonderful things in store for these families as they are used to impact the world for Christ. Please pray also for families struggling with infertility and those seeking to adopt.